Trellises serve an important function in the garden. They can be completely utilitarian or they can be a work of art. The best part is that with a little ingenuity, they can cost pennies or even be free. They can be assembled in minutes or toiled away year after year to become an intricate masterpiece. I love re-purposing things I already have. I love it even more when it is something aged and beautiful and it is given new life. A great example is this wooden ladder. It may not be beautiful, but it does have some charm. Mostly it serves a purpose. As a ladder, it’s days were over. The bottom rung pivoted and the other rungs creaked under a small person’s weight. Now it lives it’s life trellising gourds and pumpkins. With pumpkins on the side with the larger steps, I can frequently rest the growing pumpkins on the steps to take weight off the vine. The little shelf could be used for some sort of decor or even a small drip irrigation bucket as long as it’s sturdy enough. When using a ladder for a trellis, make sure that the feet are planted into the ground a bit. Once it has foliage on it, it tends to catch the wind. A strong wind could knock it over, ripping the plant up by the roots. After a long, hard winter it’s often easy to find branches that have fallen under the weight of the snow. These branches are excellent trellises. 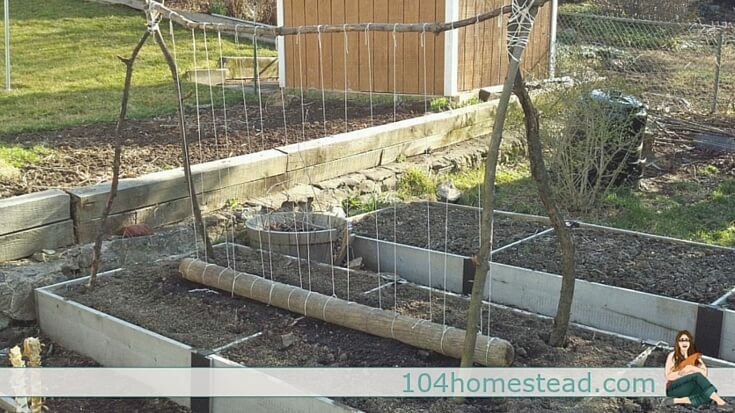 You can use them to create a teepee or as a structure to attach chicken wire or twine. The best part about these trellises is the natural feel and the free factor. By cutting or snapping the branches, you can customize them into whatever size and shape you need. Another added bonus is the bark. It creates a rough texture for tendrils to grab hold of. Image courtesy of Crispy Bits. Pallets are available almost anywhere and you can sometimes find them for free. Either staked into the ground with a 2×4 or made into a triangle like shown in the picture below, they make a great trellis for your shorter growing vines. Some caution should be used when implementing pallets in the garden. Be sure that the pallets you are using are heat treated and not chemically treated. They will be marked with HT or MB. MB stands for methyl bromide, a chemical that is not food safe. HT stands for heat treated. Heat treated pallets are safe around edible plants. Image courtesy of Preppy Pink Crocodile. Hog and cattle panels are great garden trellises because they are sturdy with a grid built in. Tall panels can be used to create an arch between two beds. The way that they are setup means they will support each other’s weight. 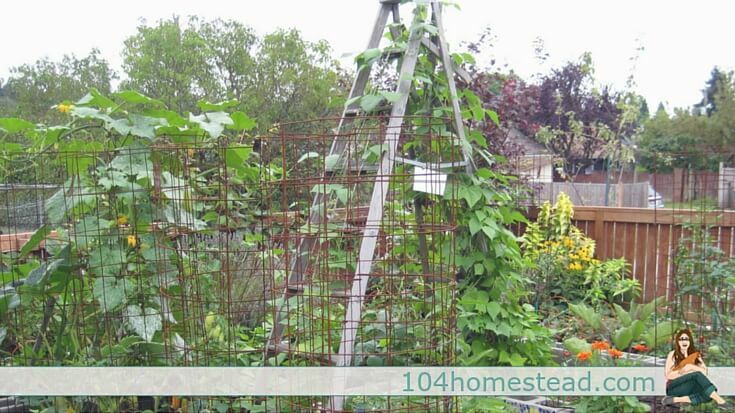 These tall panels are great for beans that frequently grow very tall. You can reach the topmost ones from inside the arch. 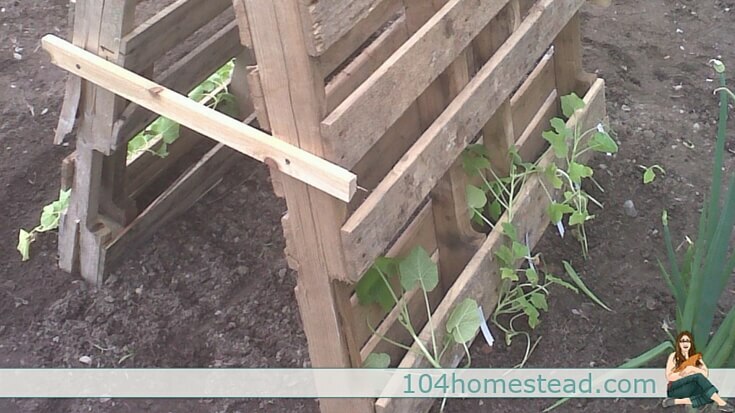 Short rows of panels can be used for short crop like snow peas. These look great grown as a border around raised beds. 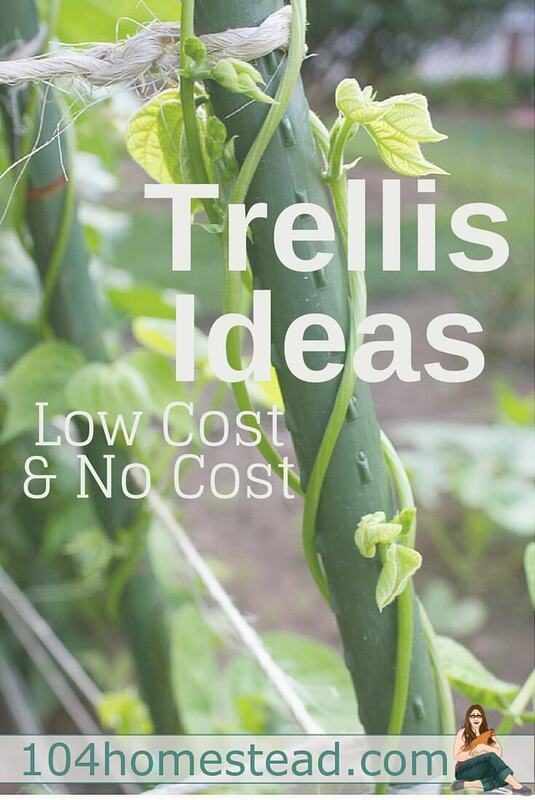 Have you discovered a great free or low cost trellis system? I’d love to hear what it is. I’m always looking for new and exciting ideas. If you are working on setting up your first garden, be sure to check out Garden Design: More Than Just Raised Beds and Setting Up a Veggie Garden in the Backyard. Where have you guy’s been all my life !!!!!. That’s a great idea! I used my chicken coop/run for our grapes. It took advantage of an existing structure, provides shade for the hens in the summer, and if you shake it all the june bugs fall off and the ladies gobble them right up. We had some pieces of an old crib someone threw out. My husband staked some of the sides and planted pinto beans around it. If you have bamboo in your area along the side your roadways and the city or county cuts them down. Ask your city’s or county’s authority if you can get them. Most likely they’ll be glad for you to take them off their hands. You can make great trellis’s out of them there are so many ways that you can arrange them for any project. The bugs want eat them just take the leaves of and any of sprouts on the stokes of bamboo. My problem is not creating a place or finding places to put trellises;but getting my chinese wisteria to bloom! What great ideas! We had one of those pop-up canopy tents blow over last year and I used parts of the frame for my pea trellis this year. I never thought to use branches….we have tons of those! Thanks again for linking up with Green Thumb Thursday. I hope to see you this week! I love the ladder trellis idea, but I disagree with it not being beautiful. It’s stunning! Really draws the eye. Thanks for the idea! I have twin bed springs zip tied to T post or hanging on the back of our shed with iron hooks for my butternut squash and gourds to climb. It works wonderful ! This will be out 2nd year for them. I also have a iron bed headboard in one raised bed for climbing cukes. My first trellis was made of branches that I harvested off the tree they cut down next door. I found about 50 4 inch nails in the dumpster of the house they were building across the street to help build it. It became un-sturdy after 3 years. I took the sides and made a fence trellis for the cucumbers. I had to replace that trellis so I made another trellis with re-purposed PVC that I bought at the habitat store. ($1 for 10 ft, 25 cents for the connectors) I made the frame with PVC, threaded a nylon web trellis on to the frame. I had some old 4 ft stakes that I slipped the PVC frame on. It can be taken down in the winter or moved to a diff bed if needed. Yes i also have a ladder for squash. Great ideas! How I wish I had an old wooden stepladder lying around! That would be so perfect in my garden. Keep your eyes peeled. You can find stuff like that all over the place when you are looking for them. My husband laughs at all the “treasures” I bring home from the side of the road because I’m sure I can repurpose them. We have an above ground pool with a large deck surrounding it, and a huge garden behind it. This year, I’m growing pole beans going up the sides of the fence that surrounds the pool! That sounds like a great idea. I love when people use edible landscaping to soften hardscapes. It make the man made look more natural. Feel free to share pictures on our Facebook page. I love stuff like this! 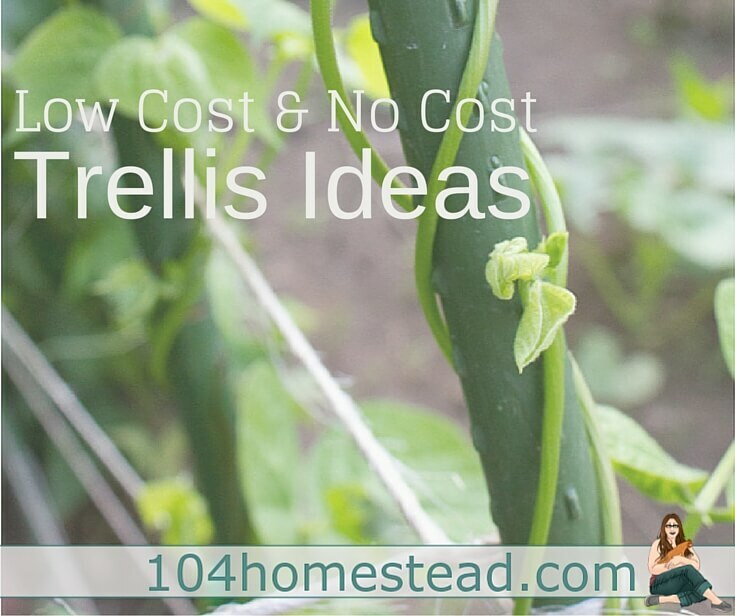 I love seeing how creative people get with cheap/free trellis ideas. I got freestanding pool ladders from FreeCycle once and trellised cucumbers up them. The blue plastic steps weren’t exactly pretty with all of the natural colors of the garden, but they were functional and provided a little bit of shade for the heat-stressed plants. I don’t pull every, single weed and one grew tall and sturdy last year — a cucumber trellised itself up the weed. I saw DIY stuff on building an A-frame for tomatoes, so this year a couple of my tomatoes are strung up underneath an old swingset frame. I’m glad reading your article. Good job, cheers.